Central Bank recruits more people to strengthen the Kenyan financial sector. - Bana Kenya News, Real African Network Tubanane. Home Business Central Bank recruits more people to strengthen the Kenyan financial sector. Central Bank recruits more people to strengthen the Kenyan financial sector. The central Bank is in plan to hire more workers following a high rate of bank malpractises. According to the CBK governor, the national treasury and the CBK has failed to combat the banking crisis in Kenya. 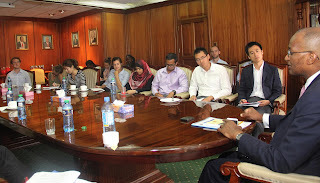 He said that by adding more watchdogs will make the financial system in Kenya be more proactive and more secure. The CBK has posted several in jobs that will make the CBK more adhesive to the financial sector cartels. Some of the positions include the information systems auditors, general operations auditors, risk officers, portfolio officers, market analysts and finance officers. CBK has been trying for the last two years to expand its inspection staff to enforce compliance in the banking sector. “It is clear that we need to strengthen our bank supervision dramatically in order to evade such cases of banks closure. We have several examples which happened within the last four years. Some of the banks were not necessarily to be closed if we had a a good well vast financial knowledge watchdogs." Says the CBK governor Njoroge.